Reg_Prescott wrote: If Berlinski is wrong about certain matters -- and I haven't the faintest doubt that he is (who isn't?) -- I, for one, would like to know about it. Let's just try to keep ourselves on the straight and narrow lest we end up with a red face and an "Oops-a-daisy!" after the auto da fe is through. If it is any consolation, Berlinski was not the original advocate of the idea about mutated programs. He had merely quoted Schutzenberger on the topic. Schutzenberger died in 1996, so his original quote likely referred to computers and their programs in the late 1980s. Computer science has changed since that time, and computers are generally significantly faster now. Berlinski backpedelled on the topic of Genetic Algorithms to small degree, but then raised it again in 2008 - 2010 time frame. The eyebrow raising part here is that he admitted that he had written genetic algorithms himself. His new discussion was not about whether the simulations showed speciation (they show speciation in a wild way), instead he raised I think a more interesting question regarding the process -- particularly the issue of complexity. It is true that the GAs take enormous amounts of tweaking and design to get going. They are stochastic processes and so are very frustrating to use (they are not magic). Berlinski mentions this in passing, seemingly as someone who has actually written one. Berlinski's new observation is that we have not reached a scientific theory that can account for the vast complexity seen in biological organisms on earth. Certainly not a theory that is as demonstrable as a theory describing planets orbiting the sun. Charles Darwin lacked the ultra-modern language we now use to describe dynamical systems, but he expressed the problem in his own way. He wrote about what he called , "Organs of Extreme Perfection and Complication"
Darwin formulated his theory from observation of traits expressed in multi-cellular life forms who were, in some sense , "fully formed" in their complexity. Origin was published prior to the discovery of microscopic single-called bacteria. Even far earlier than the discovery of viruses in 1892. Thus Darwin's conception was concerned with the variation found in extant animal species. Today however, we have this additional theory of common descent, and we suppose from that theory (+ the Cambrian fossil record) that simple organisms preceded more complex forms in geological time. We can ask whether the Darwinian process of natural selection is a sufficient account of the vast complexity seen in multicellular animals. It may be the case that the transition from single-celled bacteria to multicellular life requires a scientific theory that is distinct from Natural Selection. It may also be the case that the complexity of organic life forms on earth is not a problem requiring a solution to begin with. I am dividing my response to this and putting it into two different threads. The response here to be focused only on the issue of complexity and anything to do with trying to understand Berlinsky and his possible motivations in this thread. It seems to me the subject suffers from a considerable lack of information. We do not know how common life is in the universe. If life is a common occurrence, then I don't see how can avoid the conclusion that the difficulties have a scientific explanation we simply haven't discovered yet. If life is an extremely rare occurrence then we are simply brought to the usual divide between theists and atheists on the explanation for unlikely events, where one sees the intervention of a deity and the other sees only happenstance. But it continues to bother me when I see this absolutist attitude more appropriate to philosophy and theology which I keep seeing. Scientists take for granted that there are more refinements to be discovered in their explanations of natural phenomenon. It is always a matter of successive approximations. Newtonian physics is sufficient for most things and we only need the complexities of relativity when we reach beyond the experiences of everyday life. Likewise evolution as Darwin presented it is the first approximation explaining the situation in broadest terms but scientists take it for granted that the details require considerable refinement. Thus it is never about whether Darwin's theory is sufficient to explain everything any more than whether Newton's theory is sufficient to explain everything -- that is a rather bizarre way to approach science. I would say only this. Darwinism is often mistaken for a slow laborious process. This is a misconception and happens on a daily and weekly basis. Hour by hour. Minute by minute. It never actually stops. No other model can even compete. I don't know enough to comment further. Evolution was a big part of my uni education though. The problem arises from thinking of evolution as random. The logical position is to see it as something that will inadvertently happen under the right conditions. We depend on randomness to produce consistent results in every day life but never notice. Take making concrete for example. We never expect that the aggregate and cement will not evenly mix although it is theoretically possible. The outcome of many random events is highly predictable. Complexity is unavoidably linked to entropy. It isn't mysterious or unexpected. Life isn't the exception but the rule. It may be fragile but so are the patterns left in the sand by waves. I think I can investigate two intellectual tracts here. One of them is that complexity is unaccounted for, and requires some kind of independent theory to describe why it happens in biology. For balance, I will also describe a perspective which claims the complexity of earth-based life is not a problem requiring an "accounting for" at all to begin with. This takes longer to do because it requires graphs which I have to stitch together in a spreadsheet. As appetizer, the whole basis of this perspective is that the "emmense complexity" that Berlinski et al him-haw about is statistically rare in life forms. It is my hope that this thread will not get locked by moderators before I have finished these graphs and diagrams and posted them. Thanks for the link. I will be posting in there . Last edited by hyksos on September 7th, 2018, 3:52 pm, edited 1 time in total. I think there's a surprisingly straightforward accounting for complexity: some incremental changes in an organism happen to go in the direction of both better adaptation and slightly more complex structure. So, over the surface of an earth, over billions of years, some forms will grow more complex. And some don't, like Archaeans. The organisms that lie at the far reaches of complexity branching tend to notice their complexity. Prokaryotes not so much. Most of the biomass of the earth is microbial. The evolution of complexity is unsurprising. 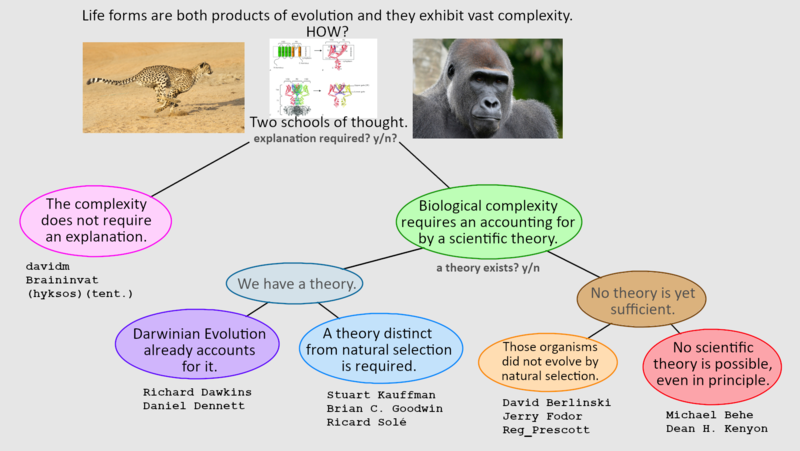 Given how evolution works, there was no where else to go but toward the more complex. Yet even so, it took nearly two billion years for eukaryotes to evolve after the appearance of life on earth. Any many biologists think this transition was a highly unlikely fluke. If that’s right, we should not expect to find many planets with complex life forms. Human-style intelligence may be much rarer still, if it exists at all. That would explain the Fermi paradox. You are 10 steps ahead of us. I will include your name in the diagram. The above List of simple life forms constitute 90% of the variation of life on earth. 10% of the rest of the "variation pie" is taken up by plants, insects, spiders, birds, reptiles, fish and mammals. Very high complexity in organisms occurs about as often as simple statistics would predict. A person who demands a scientific theory MUST (!) account for high complexity is either engaging in the fallacy of Confirmation Bias, or selective sampling bias. davidm » September 7th, 2018, 2:48 pm wrote: Yet even so, it took nearly two billion years for eukaryotes to evolve after the appearance of life on earth. Any many biologists think this transition was a highly unlikely fluke. I do not think it was a fluke. I think this conclusion is because their picture of the evolutionary process is incomplete. I think that stages of evolution of the individual are punctuated/interrupted by stages of communal evolution. We are seeing that stage right now in human civilization, but before this was the evolution of multi-cellular organisms and before that was the evolution of the eukaryote from a community/cooperation/merging of prokaryotes (and I think this pattern may even extend into the time before which properly belongs to a theory of abiogenesis). davidm » September 7th, 2018, 2:48 pm wrote: If that’s right, we should not expect to find many planets with complex life forms. Human-style intelligence may be much rarer still, if it exists at all. That would explain the Fermi paradox. Yes I think it is rare enough and the ability to travel to other stars is far more rare than that. There are many difficulties including that of making viability of colonies on other planets sufficient to spread across the galaxy, for we must not over-estimate how much a single planet can provide the materials and enormous energies for such an expansion. The argument from size which makes it almost a certainty that intelligent life exists elsewhere has the problem that it hardly means that intelligent life (let alone star-faring civilizations) is in any proximity to each other. Furthermore, I think the availability of time is greatly over-estimated. 13.7 billion years does not seem like all that much time to me considering all that has to happen before the conditions for life are available. Remember that we are made of the rarer stuff from novae at least and probably from the even rarer events of neutron star collisions -- and this is on top of the time for planets to form and the billions of years which evolution requires. The farther back in time you go the less likely they will have the materials needed for life let alone those needed for a technological civilization capable of star-faring. Last edited by hyksos on September 7th, 2018, 7:34 pm, edited 1 time in total. Berlinski and his entourage are certainly open to a theory coming along in the next 80 years that sufficiently, exhaustively accounts for biological complexity. On paper at least, they don't deny this possibility -- they assert merely that Darwinian Natural Selection could not be the process described by the theory. However, others have suggested they may be engaging in goal-post moving as a procedural tactic. Behe (on paper at least) is agnostic or silent regarding the nature of the intelligent agency that is responsible for the design of the molecular motors and ion channels seen in organisms. Creationists of William Lane Craig, Ken Ham, and Ray Comfort variety do not appear in this diagram, They don't even engage in conversation. The Bible says God did it, so God did it. How? Magic. I don't really understand the "explanation not required" answer. Science looks for explanations. Why draw the line there? But the explanations are legion for you don't even need life in order to explain complexity. You get endless complexity from some pretty simple non-linear mathematical equations/processes. And while I don't think pure Darwinian evolution is the whole picture, I don't see any reason why this by itself cannot produce endless complexity. The addition of communal evolution, which introduces/promotes specialization and communication, is however a tremendous boost to the complexity you can expect and is an important part of the explantion for the complexity we see. Five years ago, I was pretty deep into the Kauffman/Goodwin branch.